Women's basketball coach Richard Barron will take an indefinite leave, as assistant Amy Vachon takes over head coach duties. 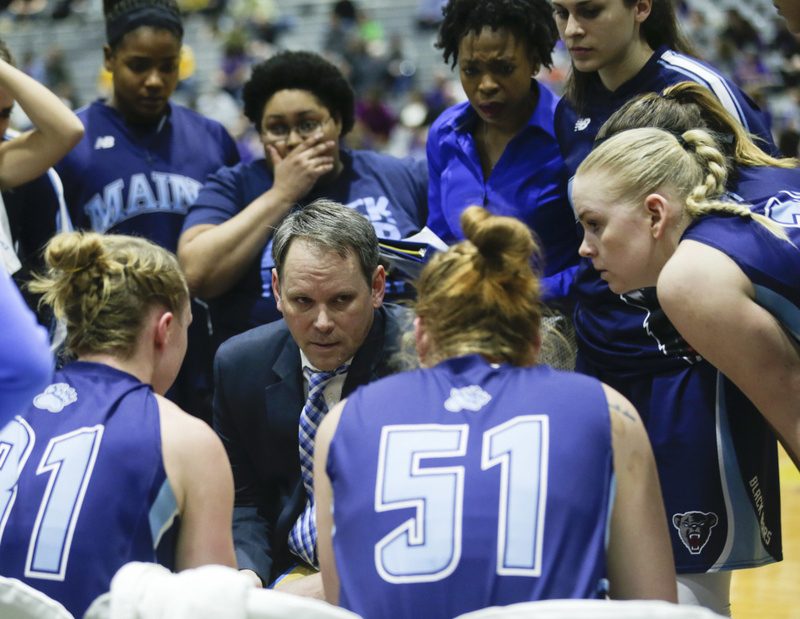 University of Maine women’s basketball coach Richard Barron is taking an indefinite medical leave, the school announced Friday. Barron is in his sixth season as Maine’s head coach, compiling an 85-89 record with the Black Bears. The past two seasons he led Maine to a share of the America East regular-season title. The university will not reveal the nature of Barron’s medical condition, according to Tyson McHatten, assistant athletic director for media relations. Associate head coach Amy Vachon will direct the team in Barron’s absence, beginning with Saturday’s game at the Cross Insurance Center in Bangor against Maryland-Baltimore County. The first hint of Barron’s ill health was Maine’s most recent home game, on Dec. 10, a 60-55 win over Dartmouth. After the game Barron briefly thanked the fans for coming but didn’t attend the postgame press conference, sending assistant coach Edniesha Curry in his place. According to WABI-TV in Bangor, Barron missed at least one day of practice after that game because of dizzy spells. But Barron returned and coached the past six games, including a 55-52 loss Wednesday night at Vermont. Vachon has been Barron’s assistant during his entire tenure at Maine. She deflected attention away from her college head coaching debut. Vachon, a former basketball star at Cony High in Augusta and the University of Maine, last served as a head coach in 2011 when she led McAuley High to the Class A state championship. Adding to Maine’s challenge is the likely absence of senior Sigi Koizar (14 points per game), the team’s leading scorer. Koizar, a 5-foot-8 guard, suffered a thigh contusion in a game Dec. 30 at Boston College and sat out Wednesday’s game. “Sigi’s making progress but she’s probably doubtful for Saturday,” Vachon said. Without Koizar, the Black Bears’ lineup is filled with freshmen and a guard (Tanesha Sutton) with one year of college experience. Maine (7-9, 0-1 in America East) has lost four straight games. The loss to Vermont was considered an upset. Saturday’s game might be considered a toss-up. Maryland-Baltimore County (5-9, 0-1) was chosen in a coaches’ preseason poll to finish second in the league (behind Albany and one place in front of Maine). The Retrievers played some difficult nonconference games (Maryland and Virginia, among them), before losing to Binghamton in their conference opener Wednesday night.